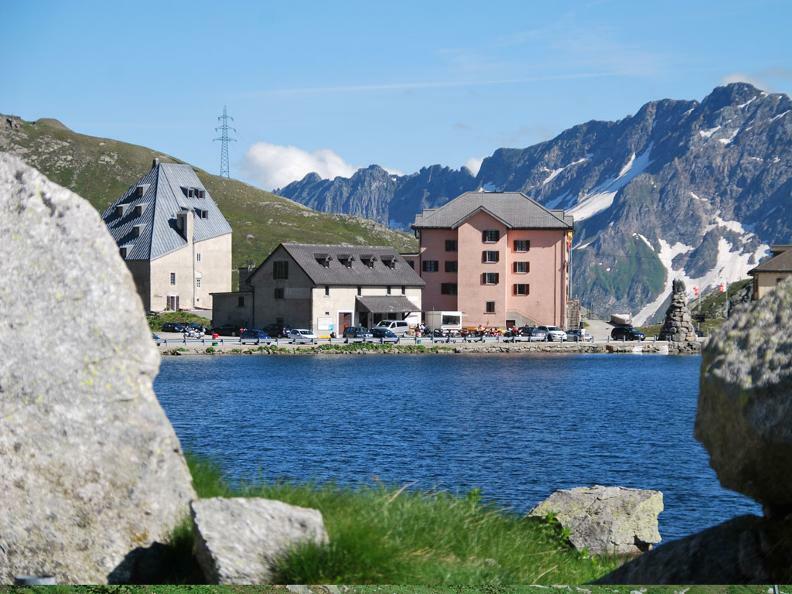 The Saint Gotthard is more than a pass. Over the centuries it has been called a centre of Europe, a vein of life or a firm rock of world’s history. This shortest connection between the North and the South has been used for thousands of years and hospitality has a long tradition on the pass. The legend says that already in the 11th century there was a chapel on the top of the pass with its mountain lakes, which protected travellers against thunderstorms. Foundation walls which were found during excavations are dating back to a pre-Romanesque, possibly Carolingian or even an earlier period. In 1230 the Milan archbishop dedicated the chapel to the Saint Godehardus – Gotthard – of Hildesheim. Shortly afterwards a hospice came into being, which offered a hideout to numerous Rome pilgrims and travellers. The first written account indicating the presence of a hospice on the pass dates from 1237. The current hospice was built around 1623, at which time it had four rooms on two floors, but it has been extended over time. From 1683, the Capuchins were in charge of the building and managed the accommodation for travellers. Because of the extreme weather conditions, the Capuchins were exceptionally allowed to wear shoes. Destitute travellers were given an accommodation, a chunk of bread, cheese and wine for refreshment; at lunchtime there was also soup. Sick people were cared for until they were ready to continue their travel. It is said that annually more than 4000 poor and destitute people have been looked after in the hospice. After a varied history – among other things the building had to be reconstructed after the war between the Russian and the French at the beginning of the 19th century – the hospice became a property of Canton Ticino. 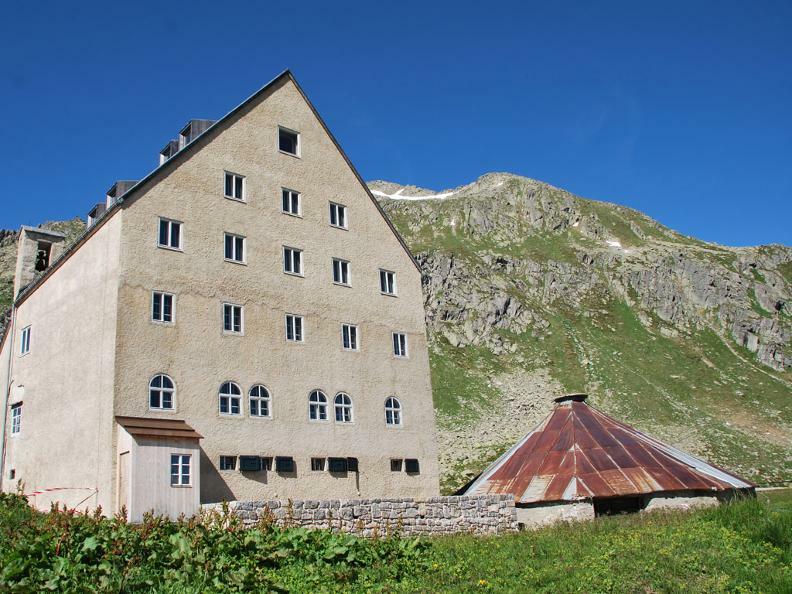 Finally, the group of buildings on the pass, to which beside the hospice also the “Sust”, a goods storage building, and the Hotel San Gottardo belong, was acquired by the Pro Sankt Gotthard foundation. Its aim was to maintain the buildings and the landscape of the St. Gotthard as witnesses of the nation’s history and as a symbol of Switzerland’s freedom and independence for future generations. Meanwhile the foundation has restored all of the buildings. The old “Sust” has been turned into a museum, which also contains a restaurant. Every year, thousands of people from all over the world visit the museum. Also the decay of the hospice has been prevented. Since August 2010 it is run as a 3 star hotel. 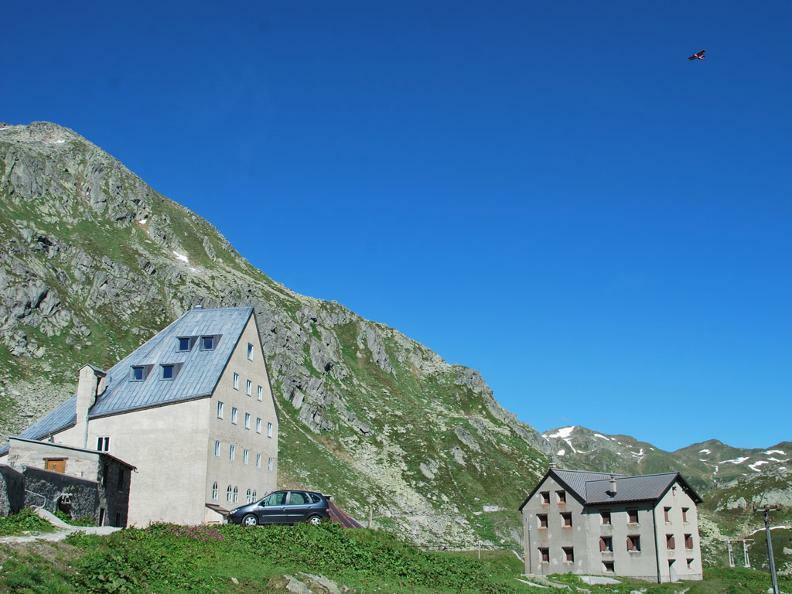 With its 14 rooms and 30 beds it serves as outbuilding of the Hotel San Gottardo. Because of its significance for the history and culture of Europe the hospice has been awarded with the European Heritage Seal. The reason for the labelling was that for centuries the hospice has been considered a symbol for the connection between the cultures in the North and in the South of Europe. Together with the St. Peter Cathedral in Geneva and the Castle of La Sarraz in the Canton of Vaud the hospice belongs to the first three sites in Switzerland to be awarded this seal.